Helpfulness of online consumer reviews: Readers’ objectives and review cues. Generally, customers seek for quality information about a product before purchasing it. The emergence of the internet has facilitated convenient access to a variety of information sources to obtain this quality information such as consumer generated ratings and reviews. These consumer-generated product evaluations are generally found on portal (e.g. google.com), retailer (e.g. Amazon), manufacturer (e.g. Nike) or product evaluation websites (e.g. yelp.com). These evaluations have strong effects on consumer persuasion, willingness to pay and trust (Tsekouras, lecture 2017). However, not all customer reviews have the same effect on purchase decisions as some reviews are perceived more helpful than others (Chen et al, 2008). Building on this research, Baek et al, 2012 tried to determine which factors influence the perceived helpfulness of online reviews. In addition, they researched which factors are more important depending on the purpose of reading a review. Furthermore, the paper extends previous research by considering two ways of looking at online reviews. Customers may take both peripheral and central cues into account when determining whether a review is helpful. Persuasion through the peripheral route requires less cognitive effort, hereby readers focus on more accessible information (e.g. the author of the review). Persuasion though the central route requires more cognitive effort, hereby customers focus on the content of the message. Data collection occurred through Amazon.com on a subset of 23 products, from a variety of categories. For these products they collected the reviews and information related to the reviewer. The final dataset included 15.059 online consumer reviews written by 1,796 reviewers. Review helpfulness is measured though customers who rated whether the review was helpful or not. The results show that a reviews’ helpfulness is affected by how inconsistent a review rating is with the average rating for that product, whether or not the review is written by a high-ranked reviewer, the length of the review message and the number of negative words included in the review message. The former finding is consistent with the negativity bias stating that negative reviews tend to be more salient than positive reviews (Tsekouras, lecture 2017). Furthermore, it shows that customers assess the helpfulness of a review merely with central cues when they buy search goodsnd high-priced products. On the other hand, they use more peripheral cues when buying experience goods and low-priced products. The findings of this research raise several practical managerial implications for firms, which I consider the main strength of the research. However, some implications may rely on the goal of the retailer, which I will elaborate on below. The findings may help web designers and marketers to design and shape their reviewing systems in such a way that review helpfulness is maximized. When more helpful reviews are written, the success of their service may increase as it leads to more customers using their service and increased sales (Chen et al. 2008; Chevalier and Mayzlin, 2006). First, as it is shown that high-ranked reviewers are more credible to readers, firms may want to request and incentivise these reviewers to review their products more often. This is already done by Amazon, as they send top reviewers free merchandise to review (Chow, 2013), which has its pros and cons in my opinion. On the one hand, these top reviewers may not take into account factors such customer service, which in my opinion is an important factor in evaluating whether or not to buy the product. On the other hand, the purchasing bias and under-reporting bias are mitigated, which may result in a more ‘true’ rating as these biases normally result in a skewed product rating distribution (Hu et al, 2009). However, this ‘true’ rating may therefore differ from the average rating, which in turn decreases – as found in the study– the perceived helpfulness of the review. Consequently, I think this issue could be a very interesting field for further research. Furthermore, to increase review helpfulness, a division between high-priced, low-priced, search and experience goods could be made. For example for high-priced and search goods the firm may want to encourage customers to write detailed messages, whereas for low-priced and experience goods reviewer credibility and review rating should emphasized more. In addition, online retailers may face a trade-off between perceived helpfulness and positivity of a review. Some retailers encourage customers to write positive reviews, however this undermines the perceived usefulness of the review, which in turn may decrease the number of customers using the retailers’ service. Therefore, in my opinion in the long run it would be more helpful to encourage customers to write honest reviews. Finally, I would like to make a suggestion for improvement. As review helpfulness is measured only though the customers who voted on whether a review was helpful or not, the findings might be less generalizable for the customers who did not vote. Consequently, the researchers may want to conduct an experiment to increase generalizability. Baek, H.; Ahn, J.; and Choi, Y. Helpfulness of online consumer reviews: Readers’ objectives and review cues. International Journal of Electronic Commerce, 17, 2 (2012), 99-126. Chen, P. Y., Dhanasobhon, S., & Smith, M. D. (2008). All reviews are not created equal: The disaggregate impact of reviews and reviewers at amazon. com. Chevalier, J.A., and Mayzlin, D. The effect of word of mouth on sales: Online book reviews. Journal of Marketing Research, 43, 3 (2006), 345–354. Hu, N., J. Zhang, and Paul A. Pavlou. (2009) “Overcoming The J-Shaped Distribution Of Product Reviews”. Communications of the ACM 52.10h: 144. Tsekouras, D. (2 March 2017), Lecture Customer Centric Digital Commerce, “Post-consumption Worth of Mouth”. NPR.org. (2013). Top Reviewers On Amazon Get Tons Of Free Stuff. [online] Available at: http://www.npr.org [Accessed 4 Mar. 2017]. We have all been there, scrolling through all the reviews before we buy something. You want to see all of this user-generated content, since you are afraid you will regret the wrong choice (Tsekouras, 2017). Also, this information overload leads to being less satisfied, less confident and more confused (Park & Lee, 2009). You could look at the average rating of the product, however these are often bimodal distributed and therefore less helpful (Zhang & Pavlou, 2009). How can you feel confident that you have seen all the important reviews, without having to read all of them? This is what Ghose & Ipeirotis (2011) studied. The authors looked at data from Amazon over a period of 15 months to study the impact of reviews on products sales and perceived usefulness. They looked at audio and video players (144 products), digital cameras (109 products) and DVDs (158 products) and their reviews. The paper identified multiple features that affect product sales and helpfulness, by incorporating two streams of research. First, the information within the review is relevant. Second, reviewer attributes might influence consumer response. Thus, perceived helpfulness does not necessarily lead to higher product sales. They also performed a predictive model, which showed the importance of reviewer-related, subjectivity and readability features on predicting the impact of reviews. Furthermore, the predictive model showed that the predictions were less accurate for experience goods, like DVDs, in comparison to search goods, such as electronics. What are the managerial implications? Amazon currently uses ‘spotlight reviews’, which displays the most important reviews. However, it requires enough votes on reviews before a ‘spotlight review’ is determined. The predictive model is able to overcome this limitation, since it is possible to immediately identify reviews that are expected to be helpful for consumers and display them first. On the other hand, it is useful for manufacturers, since they are able to modify future versions of the product or the marketing strategy, based on the reviews that affected sales most. The main strength of this paper is that it has relevant managerial implications for both consumers and manufacturers, since it studied both the effect on sales and on helpfulness for consumers. Would the findings be similar on different websites? Probably, findings will be similar for other retailers of electronics, therefore Coolblue and Mediamarkt could benefit. On the other hand, book reviews on Bol.com are not expected to have as much benefit from the model, since they are experience goods, similar to DVDs. Not as straightforward, are the implications for clothing retailers. However, I expect these retailers will not benefit as much from the model, since often there is no overload of reviews on clothing websites and therefore there is no need to reduce the information. Hu, N., Zhang, J. and Pavlou, P.A. (2009). Overcoming the J-shaped distribution of product reviews. Communications of the ACM, 52(10), pp.144-147. Park, D. H., & Lee, J. (2009). eWOM overload and its effect on consumer behavioral intention depending on consumer involvement. Electronic Commerce Research and Applications, 7(4), 386-398. Tsekouras, D. (2017). Customer centric digital commerce: Personalization & Product Recommendations [PowerPoint slide]. Retrieved from Blackboard. There are two kinds of people, which one are you? Do you prefer Coke or Pepsi? Do you eat your burger with cheese or without? And what about coffee, Americano or espresso? Zomato ensures that every meal, for users with all kinds of preferences, is a great experience. Zomato is an India-based restaurant directory startup, that provides detailed information regarding restaurants nearby, including scanned menus, and also user’s reviews and photos of their gastronomic experiences. Zomato also includes real-time information about the restaurant and lets users book tables through its iOS and Android apps. Zomato has 1,398,900 listed restaurants in 22 countries. With the recent acquisition of Urbanspoon, Zomato will break into the US market, competing against services like Foursquare and Yelp. The business model is quite simple, Zomato hires people to visit restaurants and to send the data to the team, including up to date information on new openings and scanned copies of menus. 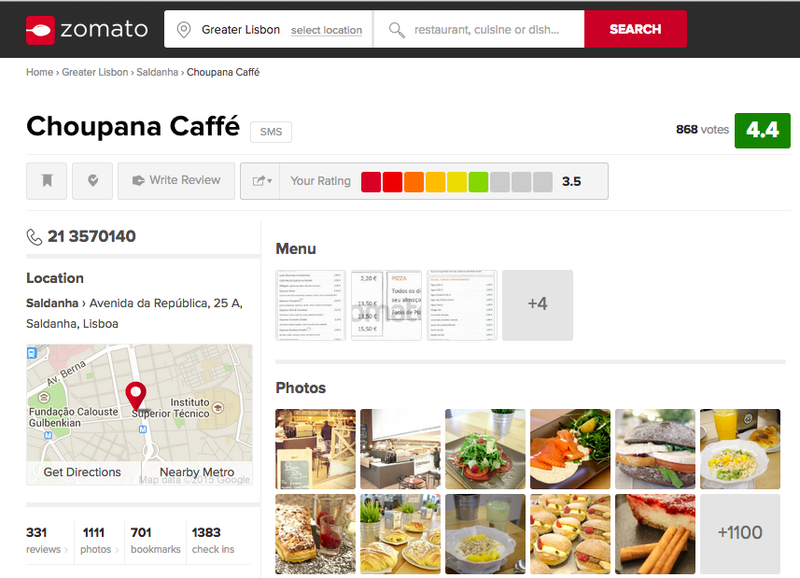 Users can then share photos of their dishes and evaluate restaurants in order to help other users decide where to eat. The detailed informations available for each restaurant is then a result of the combined inputs of both the Zomato’s team and the users. At Zomato, user’s evaluation takes the form of both a rating, using a 5-points scale and a review. Given that consumers with more extreme opinions (very satisfied or dissatisfied) are more likely to rate (Li and Hitt, 2008), most restaurants have a score of either close to 1 or higher than 4, as the image bellow exemplifies. 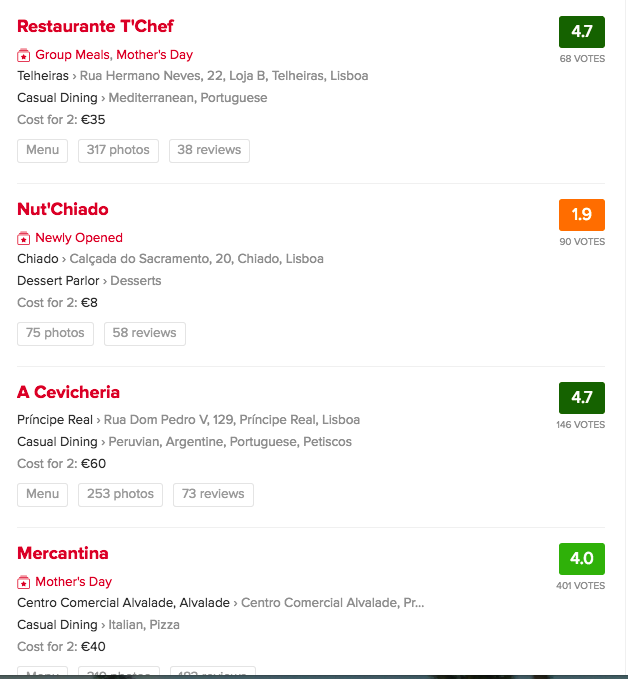 Product rating is crucial for Zomato given that it is an integral element of online businesses especially for experience goods (Tsekouras, 2015) and because they are a reflection of product quality (Hu et al., 2009). Also, consumers tend to trust more opinions derived from others customers than information provided by the vendors themselves (Chevalier and Mayzlin, 2006), which is why having a high number of reviews is a key success factor for Zomato. Social surroundings are then of crucial importance given that the success of Zomato relies on the degree to which there is interaction between users, through comments, ratings and a community creation of “foodies”, and the degree to which network effects take place i.e. where a good or service becomes more valuable because more people use it (Katz and Shapiro, 1994). As according to Grönroos and Voima (2013), the customer’s well-being of Zomato is increased through the process, as more user’s feedback is available for each restaurant. As a startup, Zomato relies in eWOM in order to attract new users and generate brand awareness. Unlike traditional WOM, eWOM has much broader effects, in part because there is no need to have a pre existing connection between the sender and the receiver. As so, eWOM applies to Zomato since it operates in an online context whereas traditional WOM typically happens in a face-to-face context (King et al., 2014). Zomato is providing value for the consumers whilst the consumers are also creating value for each other, through their evaluations and photos. This reflects a finding in the article by Saarijarvi et al (2013), which states that it is important to evaluate what kind of value is co-created and for whom, meaning that value can have a different meaning for different actors in the co-creation process. Zomato also generates great value for restaurants. In fact it is one of the most cost-effective high-impact marketing platform for dining establishments. Check out the best place for you at https://www.zomato.com/! Chevalier, J. A. and D. Mayzlin (2006). “The Effect of Word of Mouth on Sales: Online Book Re- views.” Journal of Marketing Research 43(3), 345–354. Katz, M.L. & Shapiro, C. (1994). Systems Competition and Network Effects, The Journal of Economic Perspectives, 8(2), 93-115. Li, X., & Hitt, L. M. (2008). Self-selection and information role of online product reviews. Infor- mation Systems Research, 19(4), 456-474. Saarijärvi, H., Kannan, P.K., & Kuusela, H. (2013). Value co-creation: theoretical approaches and practical implications. European Business Review, 25(1), 6-19. Tsekouras, D. (2015) Variations On A Rating Scale: The Effect On Extreme Response Tendency In Product Ratings, working paper. What Makes a Helpful Online Review? We have all been there; browsing for too long on Tripadvisor.com or Amazon.com trying to find that one review that could be the decisive factor in buying (or not buying) that specific product. But what exactly is it that we are looking for? What makes one review more helpful than another? The article of Mudambi and Schuff (2010) tries to find the answers to these questions by reviewing almost 1600 reviews on Amazon.com throughout several products and product categories. When browsing online, individuals are presented an increasing amount of customer reviews; these reviews have proven to increase buyers’ trust, aid customer decision making and increase product sales (Mudambi, Schuff & Zhang, 2014). In addition, customer reviews can attract potential visitors and can increase the amount spent on the website. Hence, retail sites with more helpful reviews hold greater potential to offer value to consumers, sellers as well as the platform hosting the customer reviews. In order to increase the helpfulness of customer reviews, several websites such as Amazon.com and Yelp.nl ask the question “was this review helpful to you?” and list more helpful reviews more prominently on the product information page. Mudambi and Schuff (2010: 186) define a helpful review as a “peer-generated product evaluation that facilitates the consumer’s purchase decision process”. The article distinguishes between two types of goods when looking for products online: search goods and experience goods. Search goods possess attributes that can be measured objectively, whereas the attributes of experience goods are not as easily objectively evaluated, but are rather dependent on taste. Examples of search goods are printers and cameras; examples of experience goods are CD’s and food products. Past research showed conflicting findings as to whether extreme ratings (rating very negatively or very positively) are more helpful that moderate reviews; some argue that extreme ratings are more influential, whereas others argue that moderate reviews are more credible. Mudambi and Schuff (2010) argue that taste often plays a large role with experience goods as consumers are quite subjective when rating; hence, consumers would value moderate ratings of experience goods more, as they could represent a more objective assessment (H1). Next, Mudambi and Schuff (2010 scrutinize the review depth of customer reviews. Since longer reviews often include more product details, and more details about the context it was used in, the authors hypothesize that review depth has a positive impact on the helpfulness of the review (H2). Nevertheless, the review-depth of a review might not be equally important for all products. Reviews for experience goods often include unrelated comments or comments so subjective that they are not interesting to the reader. For example, movie reviews often entail elaborate opinions on actors/actresses that are not important for the reader. On the other hand, reviews of search goods are often presented in a fact-based manner as attributes can be objectively measured. As a result, it is argued that review depth has a greater positive effect on the helpfulness of the review for search goods than for experience goods (H3). By evaluating almost 1600 reviews (distributed over 6 products; 3 experience goods and 3 search goods) and excluding the ones that did not get any vote whether it was helpful or not, the researchers were able to confirm all three hypotheses. The article teaches us that there is no one-size-fits-all method as to what makes a reviewhelpful. Experience goods prove to be less helpful with extreme ratings, whereas search goods benefit from in-depth reviews. Mudambi, S. & Schuff, D. (2010). What Makes a Helpful Online Review? A Study of Customer Reviews on Amazon.com. MIS Quarterly, Vol 34 (1), pp 185-200. Mudambi, S., Schuff, D. & Zhang, Z. (2014). Why Aren’t the Stars Aligned? An Analysis of Online Review Content and Star Ratings. IEEE Computer Science, 3139 -3147. Finding the best restaurant in town is not easy. Therefore a vast number of applications and websites provide services to facilitate the search. The “online urban guide” and business review site Yelp is the most popular among them. It uses automated software to recommend the most helpful and reliable reviews for its users and to help them connect with local businesses. Like most other recommendation websites, it combines numerical ratings with textual reviews. Yelp contains over 57 million local reviews and attracts around 130 million users monthly. Companies are aware of the power of word-of-mouth. Online user reviews have become an increasingly important source of information for consumers. However, when it comes to more personal local services such as finding a trustworthy craftsman, lawyer, or the most competent physiotherapist online recommendation websites like Yelp are only used as a last resort. „People don’t go to Yelp for doctors or lawyers because of trust issues“, says Mohit, the founder of GemShare. „Positive reviews from strangers don’t guarantee that you, too, will value what is likely a very personalized and intimate experience.“ Besides the relevance of taste and trust for these services, people are also aware of fraud within online recommendation systems. Especially local services that are not used by a sufficient quantity of people to obtain the wisdom-of-the-crowd-effect, reviews and ratings can easily be manipulated by self-ratings of companies. The alternative to the time-consuming and sometimes untrustworthy use of common online recommendation platforms is to ask the own personal network for advice, but even with all our social networks and technical devices, this approach can also be time-consuming and frustrating. 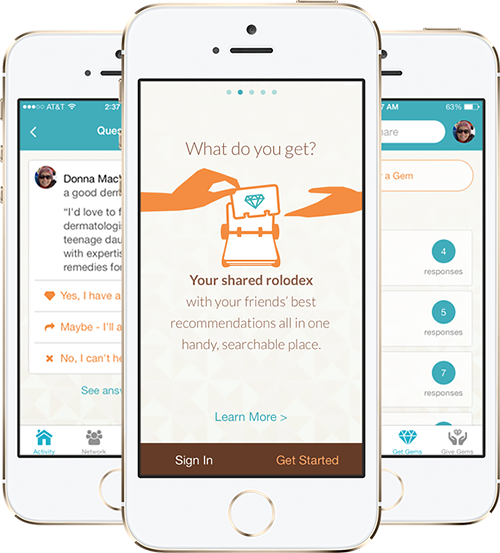 GemShare, launched in April, 2014, is a recommendation platform and application that focuses on trust and personal recommendations to solve this issue. “We have several members who have said two thumbs up from a friend is worth more than 40-star reviews,” says Mohit. Users create their own trusted network of friends and like-minded people, via Facebook, Gmail, or phone contacts, for the specific purpose of finding out where to find the best service. Can you really rely on online product reviews? Product reviews on online platforms are growing in popularity1,2. Platforms like Amazon, Google or the App store use product reviews to show which products have the best experience in usage by other consumers. Most of these product reviews are extremely positive about the product3, but does this indicate that all products are extremely good and that there is no moderate product on the online market? Let’s give it a try to search on Amazon three random product reviews from books, video games and sports. The results are shown in table 1. As can be seen from the table, two of those random reviews are extremely positive (the book and the sport watch) and one is extremely negative (the video game). An experiment done by Hu et al., (2009) asked customers to rate a music CD on a 5-star scale. This experiment shows an almost normal distribution, which can be expected if the ratings are randomly done by every buyer of the product. Most of the reviews on Amazon (table 1) show a so called J-shape distribution and not the outcome of the explained experiment. What could be the cause of those differences? Selling your products to Justin Bieber? No way! With the total amount of social media fans across different platforms (Twitter: 51 million followers (1), Facebook: 66 million likes (2) and Instagram: 15 million followers (3)) exceeding the population of Japan (which currently has around 127 million inhabitants), Justin Bieber is arguably the most popular person on the planet. With this popularity come a lot of perks: the best perks according to regular human beings are the endorsement deals that the Canadian superstar signs on a regular basis. One of these deals was to design his personal nail polish called ‘One Less Lonely Girl’. Certainly this was worth around $12,500,000 (4). Since almost all major brands engage in this behavior, these celebrity endorsement deals must give the brand something in return. However, not every company has a spare $163.75 million in cash to endorse athletes (or other celebrities) like Nike does (5). So what can the smaller companies do to get the same exposure as these large global brands? Because those smaller companies can simply not afford to sponsor the superstars of today, it seems that they can only hope and pray that somebody like Justin Bieber enters their store and purchases their product. If he then writes an objective review about the product on one of his social media platforms, a logical consequence seems that the owner of the smaller company will be able to retire at an early age.